Lala Jagdish Prasad & Co., was formerly formed by Seth Shree Deen Dayal Saini in the original name and style of M/s Lala Pragdutt Deen Dayal, long ago nearly about in the year 1915. With the honest dealing and with the motto to satisfy our valued customers, and providing them the best, 100% pure, natural, genuine, concentrated products of the trade, the business earned a good name and fame, where the products were sold just by the name of the company. Later with the expansion in the business the same was bifurcated in the best interest of the business for its multifold expansion one of the businesses in the name and style of M/s Lala Pragdutt Kamta Prasad was stared by my Grand father Late Kamta Prasad Saini, and then with the most wanted demand in the business, it was further bifurcated and one of the businesses in the name and style of M/s Lala Pragdutt Jagdish Prasad was formed by my father Late Jagdish Prasad Saini. Under the unwarranted circumstances Mr. Jitendra Kumar Saini, the present Managing Partner of the business has continued the same business under the name and style of M/s Lala Jagdish Prasad & Company. Though the name of the company has changed, due to some unwanted circumstances, but the motto still remains the same with Mr. Jitendra Kumar Saini, to provide the valued customers the best, 100% pure, natural genuine, concentrated products. Even in this age of competition and usage of every hook and crook methods to earn profits, Mr. Jitendra has struck to the old policies laid down by his great grand fathers, and still HONESTY is in the foundation of our business relations. And we are proud in declaring that we are having a good and old clientage than any other competitors in this trade, our business relations are still continuing with those customers who joined hands with us in 1915. We have a strong belief in an old saying in our parts that YOU CANNOT COOK TWICE IN WOODEN VESSELS, and build our business relations on the foundation of honesty and personal relations, where both of us are bound to have a very fair dealing with full of honesty. The firm has its Administrative office at Kanpur and factories at Hasain (UP) and Kaluapalli (Ganjam, Orissa), for manufacturing of Attar Gulab (Rose), Rooh Gulab (Rose Oil), Rose water, Attar Motia, Shamama, Hina, Mehandi (Gulhina), Attar Kewra, Kewra water, Rooh Kewra (Kewra Oil), Molshri and Champa. The unit is a 100% EOU. The firm has participated in the Dubai Intrenational Fair with CHEMEXCIL. It is the receipient of five "CERTIFICATE OF MERIT" awards from CHEMEXCIL. Further First and Second awards from the Govt. of U.P. and are holders of the GREEN GOLD CARD from the U.P. Govt. 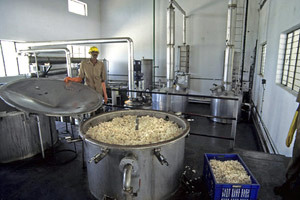 The firm is manufacturing and exporting Indian Perfumes (Attars) free from Alchohol, Natural Essential Oils, Aromatherapy Oils, Massage Oils, Aromatherapy Essential Oils, Aromatherapy Massage Oils, Rose Water and Kewra Water to U.S.A., U.K., France, Switzerland, Israel, Australia, Burma, Bangladesh, Thailand, Singapore, Malayasia, UAE, Kuwait, Oman, Saudi Arabia and Bahrain and are well recognized for the quality of our products by all our customers. Our methods of production, though traditional, are very accurate and we have to our credit a work force which is very experienced and dedicated to this profession. LJP & CO. is committed towards protecting the environment & ensuring the health and safety of its peoples and customers. Caring for the environment is core corporate values by withdrawing work on endanger species. LJP & CO. accords a very high priority to hygiene monitoring at the work place. Manufacturing products safely and in an environmentally responsible manner. Social responsibilities continue to be an integral part of our business. LJP & CO. makes a significant contribution to society through donations, conducting aromatherapy awareness programs and community development. While selecting projects, priority is given to thosewhich contribute to health care. Our Research & Development section continued their efforts to provide competitive advantage through innovations in the area of new fragrance and herbal extracts by keeping the naturalness of products. In the area of fragrance LJP & CO. research & develops several new formulations for meeting market and consumers personal requirements. Innovation is necessary to satisfy new customer needs and create new streams of products. Innovation is necessary to create higher values for customers. Lala Jagdish Prasad & Co. is its ability to create value for customers. The only way to eliminate limitation is to continuously run the engine of innovation.